Bellefonte bed and breakfast travel guide for romantic, historic and adventure b&b's. 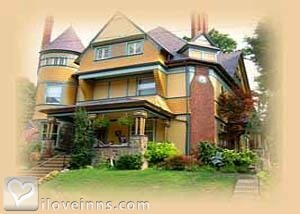 Browse through the iLoveInns.com database of Bellefonte, Pennsylvania bed and breakfasts and country inns to find detailed listings that include room rates, special deals and area activities. You can click on the 'check rates and availability' button to contact the innkeeper. There is a borough in Centre County, Pennsylvania that is really worth visiting - the community of Bellefonte. Tagged as the Best Fly Fishing Town in Pennsylvania, Bellefonte hosts Spring Creek offering one of the finest fly fishing spots in the state. You can also try Penns Creek, Fishing Creek, Spruce Creek and the Little Juniata River which are all close by. One of the most interesting attractions of this town is its deep Victorian heritage found in the many structures around the borough starting with the 1800s first jail which has an 8-foot underground dungeon. The Hastings Mansion, remodeled by Governor Daniel H. Hastings is another fine example of a Victorian inspired building. You can also visit the Bush House which was built in 1868 - one of the very first hotels to use electric lights. You can stay at any Bellefonte bed and breakfast for that relaxing getaway. By Our Fair Lady, A Victorian B&B.